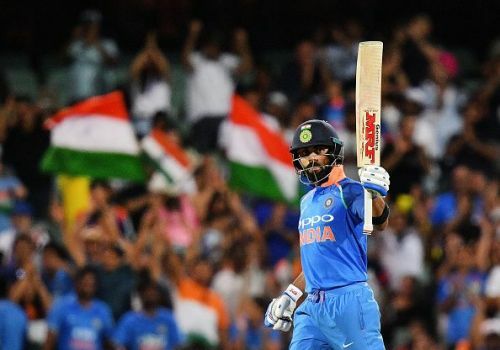 India pulled off a sensational chase at the Adelaide Oval to level the series going into the final ODI at the MCG. Set 299 for victory, the visitors made it past the finish line courtesy a sublime century by their skipper, Virat Kohli and a well-crafted fifty by MS Dhoni. Australia got off to a poor start and lost both their openers within the power-play. While Bhuvneshwar Kumar again went through Finch’s defense, Shami surprised Carey with a short delivery to send the wicket-keeper packing. Shaun Marsh then joined hands with the likes of Khawaja, Stoinis and Maxwell to post a competitive total on the board. In reply, the Indians got off to a flyer when Dhawan went ballistic at the top. After his dismissal, arguably India’s two best limited overs batsmen, Rohit Sharma and Virat Kohli combined to take India across the 100-run mark. However, India were accorded a little wobble in the middle when Rohit and Rayudu failed to get going and the asking rate went over seven per over. Yet, like many a time before, Dhoni and Kohli made sure that the total wasn’t beyond their reach and in the end, the visitors won with four balls to spare to stay alive in the series. Going into the 50-over world cup, India has most bases covered, yet one of those bucking the trend was that of the back-up fast bowler. Over the past year, the Indian team have tried a host of bowlers to complement Bumrah and Bhuvneshwar, but to none of them managed to seal their place. However, after throwing Mohammed Shami’s name into the fast bowling attack, their search seems to be finally bearing fruit. The pacer was impressive in the first ODI and today again, he started from where he left off in Sydney. Shami ended up with 3 for 58 in the second ODI and fulfilled every task asked of him. The pacer bowled with fire in the initial overs and extracted movement off a seemingly docile pitch. However, it was his death bowling that was the cause of most joy. Entrusted with bowling in the slog overs, he performed with aplomb and mixed his pace while also bowling the yorkers to perfection. The hunt for a back-up fast bowler has been quite arduous and so far, it had been futile. Yet, by going back to the tried and tested Shami, the Indian team management might have just pulled a rabbit out of the hat.